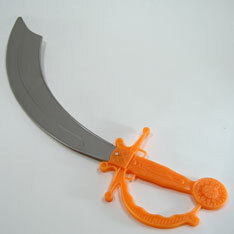 Ship-shape swashbuckling swordplay by the seaside is guaranteed with these traditional pirate close-arms weapons. 18 inches long. All plastic. Sold by the dozen. $9.95 per dozen for 12 dozen or more. $8.55 per dozen for 24 dozen or more.